If you have an open fire in your home, you should consider replacing it with an enclosed stove (aka closed flue appliance). The saving in fuel to produce the same heat output is incredible. An open fire has an efficiency of around 18%, as the vast majority of the heat simply goes up the chimney. By comparison a quality stove has an efficiency of around 80%. So a stove uses 4 times less fuel to achieve the same heat output. There are other ways the stove saves energy. 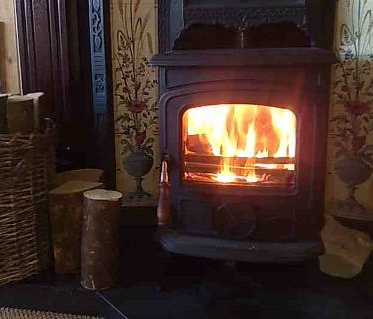 When a room is heated by an open fire and the fire goes out, it is difficult to keep the room warm as the heat is still lost up the open chimney. In comparison there is little chimney draft with an enclosed stove when the fire goes out as the flue is closed; and even the small air intake can be closed off to prevent that small loss. A back boiler can be fitted to the stove and used to heat the house. Having a stove, or any closed flue appliance, will boost the BRE certificate rating of your house. The smallest multi-fuel stoves (5kW- one room) start at €400, with an additional €150 being necessary for the flue/ chimney adapter. Buy and install a carbon monoxide detector to protect against flue gas leaks, this is approx €35 in local hardware stores. If your home is well sealed and has a heat recovery ventilation system then the stove must be fitted with an air supply duct from the outside environment. Some stoves may not allow this option, so it is worth checking before purchase. During use the surface of the stove will get extremely hot and if there are children in the house a child protection guard is essential. If your stove is placed on the hearth surface, i.e. not an inset, you may need to buy a metal tray to extend out the non-combustible surface. The distance from the stove door to a combustible surface must be in excess of 300mm. There are other requirements which can be checked here. It is useful to buy a separate metal container to dump the hot ashes into prior to disposal, this allows the ash to cool down safely. Get a trained professional to install the stove and flue, the risk from a poorly installed flue is too great to risk installing it yourself.